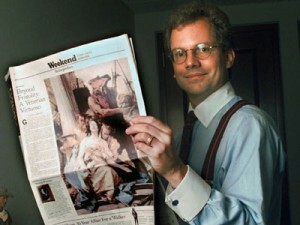 New York Times boss Arthur Sulzberger Jr. Recently, New York Times staffers boldly confronted their institution. In a near outright insurrection, published December 23 as an open letter to their boss, Arthur Sulzberger Jr., 561 staffers and a few retirees signed a declaration of frustration. We’ve got our own declaration to those Times folks—a way out of this mess. We, the Guild leadership and many reporters, editors, account managers and other Times employees, Guild members and otherwise, are writing to express profound dismay at several recent developments. Our foreign citizen employees in overseas bureaus have just had their pensions frozen with only a week’s warning. Some of these people have risked their lives so that we can do our jobs. A couple have even lost them. Many have spent their entire careers at the Times — indeed, some have letters from your father explaining the pension system — and deserve better treatment. At the same time, your negotiators have demanded a freeze of our pension plan and an end to our independent health insurance. We ask you to withdraw these demands so that negotiations on a new contract can proceed fruitfully and expeditiously. We also urge you to reconsider the decision to eliminate the pensions of the foreign employees. We have worked long and hard for this company and have given up pay to keep it solvent. Some of us have risked our lives for it. You have eloquently recognized and paid moving tribute to our work and devotion. The deep disconnect between those words and the demands of your negotiators have given rise to a sense of betrayal. One of our colleagues in senior management recently announced her retirement from the paper, which is reported to include a very generous severance and retirement package, including full pension benefits. All of us who work at the Times deserve to have a secured retirement; this should not be a privilege cynically reserved to senior management. We strongly urge you to keep faith with your words and our shared mission of putting out the best newspaper in the world. New York Timesians, welcome to the real world. In the end, the problem is the ownership of the media. In the end, you work on a plantation. Granted, it is a plush plantation, and there are many benefits, not the least of which is the status it accords. But you’re very much working for the establishment. And the establishment is looking out for their interests, chiefly, not yours, or ours, no matter how much they try and tell us otherwise. Why not, in this new world, take a risk to create a better journalism, one not owned by rich people or corporations? Why not get involved with journalism whose only agenda is to figure out what is really going on, and then say so? That gets right to the point of what you discovered in your reporting, without pretending to be above the fray and reporting what powerful, self-interested “sources” tell you as if it is the gospel? You can see what corporate ownership (even the kind dominated by single families—think Walmart and the Waltons, not just the Sulzbergers and the New York Times) does to journalists: it causes them to hold their fire. News outlets are really too important to democracy and the public interest to let them nestle in the bosom of the rich. Think of all the times The Times has been wrong, pressing you toward the establishment consensus on stories where you knew that was not the right place to be, journalistically. The Times has exaggerated the importance of things like the Iowa caucuses and primaries in terms of giving the public false confidence they actually have a say in what is an increasingly tenuous democracy. It played a central role in the rush to war with Iraq, and a lack of investigative rigor on the real reasons for intervening in Libya. It has been so terrified of being labeled as “conspiracy theorists” that it has ignored important legitimate reporting on 9/11 and the inconsistent government explanations of the raid that “got” Bin Laden. It has shown cluelessness on Occupy Wall Street. Its columnists defended a friend instead of investigating him for fraud. It has been excessively soft toward “acceptable” candidates like Mitt Romney and rough on those who would ruffle feathers. The Times investigates the establishment, up to a point. But in the end, it upholds the establishment. It is a wholly owned subsidiary. Think of the hoary old discredited memes, like the Warren Report, that the spirit of the place keeps flame for some reason. Think of its preference for bland middle of the road candidates who can do nothing to stop this country’s slide to the bottom. And for “order,” when what we may need, in a country increasingly experiencing corporate-driven chaos, is a little more healthy disorder. Corporate-owned media has been “in charge” of providing the dominant national narrative, helping us understand where we are and why, and what we can do about it. And how good a job, would you say, it has done, overall? Are things much better after this long reign? Most of you are fine people—some are my friends—and many of you do great work, or at least the best you are able under certain constraints. But in the end you are on the plantation. You may petition your owner, as you have, but he’s got the upper hand. He certainly isn’t going to give up a lot so that you may keep your pension. I understand you want to keep your job and your benefits. But does it really feel that good being on the corporate plantation? Come join us. Ask the deep questions, write whatever you learn. No holds barred. Work in an outfit that takes itself a little less seriously—but takes the truth very seriously indeed. Help us collect the people and the resources, and build a more perfect journalism.